The date 18 March marks the anniversary of the Ottoman naval victory in 1915, when British and French ships tried unsuccessfully to force a passage through the Dardanelles. Commemoration of this victory was slow to get under way in the subsequent years and the first ‘official, state-sponsored’ ceremony did not happen till 18 March 1934 and it was ‘a very modest affair’. It is this modest affair that Cengiz Özakinci describes in an article in the January 2016 edition of Bütün Dünya (Ankara). Özakinci has written a number of articles critically assessing the evidence for events during and after the Great War and they can be found on the Honest History website. Honest History has been particularly interested in the provenance of the famous ‘Atatürk words’ commencing ‘Those heroes that shed their blood …’, of which there are two well-known versions and which are variously said to have been spoken by Mustafa Kemal (later Atatürk), written by him, or written by him and then spoken on his behalf by his minister, Şükrü Kaya. For example, the website of the Turkish Embassy in Canberra quotes one version of the words and says that they ‘were delivered on his [Kemal’s] behalf by Şükrü Kaya, the Minister of the Interior, on the occasion of the anniversary of the Çanakkale Victory and the Martyrs’ Day, on 18 March 1934’. The Australian War Memorial has one version of the words on a panel on the wall and another version nearby on audio, uttered in a BBC-style voice, accompanied by a picture of Atatürk. Cengiz Özakinci, in his article which can be translated as ‘The unforgettable heroes of the 18th of March naval victory’, gives an account of the commemorative ceremonies marking the 19th anniversary of the battle. Starting with the brief history of the origins of the campaign and the initial Allied attack, Özakinci says that, almost twenty years on, the hidden heroes of Gallipoli began to be present and commemorated. He points out that earlier ceremonies at the site only focused on Corporal Seyid and his achievements, while the 1934 ceremony, organised by Çanakkale People’s Houses, also included Corporal Cemal (behind Corporal Seyid in the well-known photos of the latter carrying artillery shells weighing 275 kg). The article continues with the personal account of Corporal Cemal and some details on the participants in the 19th anniversary of the naval victory, supported by some photos from the newspapers of the time. 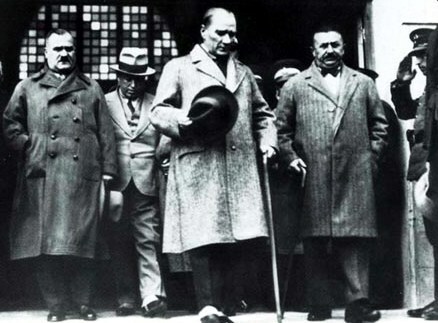 Kaya was a close associate of Mustafa Kemal. If Kaya had spoken during the Martyrs’ Day ceremony in March 1934 his speech would have been widely reported, particularly if he spoke words given to him by Kemal, the Ghazi (‘warrior’ or ‘champion’), the President of Turkey, a man at the height of his powers, soon to be given the title ‘Atatürk’ (‘Father Turk’ or ‘Ancestor Turk’), the man reputed by 1934 to have been the decisive commander at Gallipoli in 1915. Such a speech would have been the highlight of the day. Utkan Kocatürk’s publisher, the Atatürk Research Center, is part of a Turkish government body, the Atatürk High Institution – some translations say ‘Supreme Council’ – of Culture, Language and History, set up under Article 134 of the Turkish Constitution of 1982. 18 March 1934, Gallipoli: Minister of the Interior Sükrü Kaya’s speech – which Atatürk himself wrote and provided the text – at the Mehmets Monument, addressed to other nations’ soldiers who lost their lives at Gallipoli. Another book by the same author [Utkan Kocatürk] which was first published with the title of Atatürk ve Türk Devrimi Kronolojisi (Atatürk and the Chronology of Turkish Revolution) in 1973 and then changed to Atatürk ve Türkiye Cumhuriyeti Tarihi Kronolojisi (Ataturk and the Chronology of the History of the Turkish Republic (1st edition 1983, 2nd edition 1988) does not have the above comments on Şükrü Kaya being in Gallipoli in 1934. 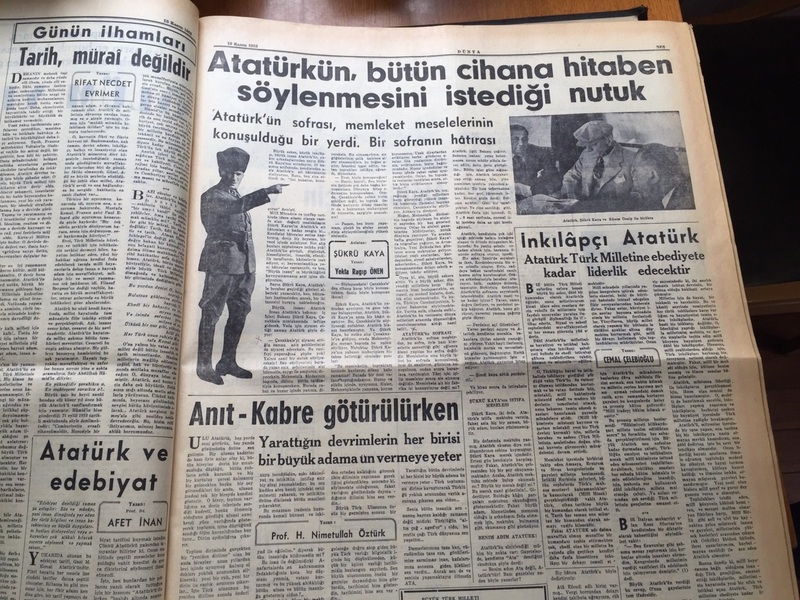 There are two press reports (here and here) of Kaya visiting Gallipoli in July 1934 during a tour of Thrace. The reports include a long statement from Kaya referring among other matters to the presence of Jews in Turkey but they say nothing about speeches composed by Kemal or anyone else. The above quote from Kocatürk’s From Birth to Death, first published in 1988, is an example of the received version of how the ‘Atatürk words’ came into existence. Yet even an Atatürk specialist like Kocatürk – his Wikipedia entry shows eleven publications on Atatürk between 1969 and 2005, some with multiple editions – published by a government body set up ‘to disseminate information on the thought, principles and reforms of Atatürk‘, hedged his bets on the Kaya speech, including the ‘Atatürk words’. He accepted the date only ‘cautiously’. 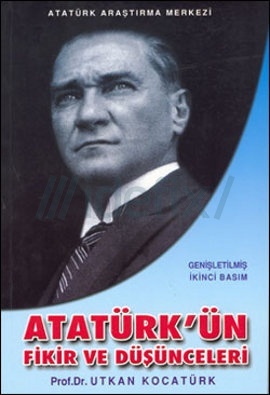 Kocatürk’s book, Özakinci says, ‘is the origin of the claims that the date of Sükrü Kaya’s speech written by Ataturk was 18 March 1934 at the 19th anniversary of the Dardanelles Naval Victory celebration in Çanakkale. But … this claim is wrong’. Not just cautious, but wrong. Kocatürk gives Kaya’s 1953 Dünya interview with journalist Yekta Ragip Önen as the source for his claim. But the Dünya interview includes no date. The date 1934 is attributed by Uluğ İğdemir of the Turkish Historical Society in his 1978 booklet Atatürk ve Anzaklar (Atatürk and the Anzacs), which reprints the interview. (The Turkish Historical Society was established by Atatürk in 1931, was semi-official for decades and became a government body in August 1983, as part of the Atatürk High Institution of Culture, Language and History referred to above, alongside the Atatürk Research Center.) 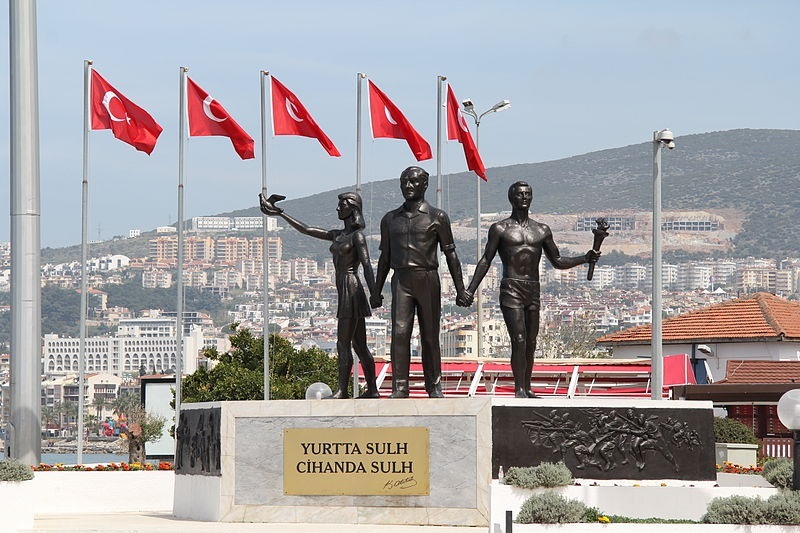 The Dünya interview says the speech was delivered near the Mehmets Monument. Kocatürk presumably knew there had been a ceremony at Çanakkale on 18 March 1934 so, ‘cautiously’, he concluded that Kaya had delivered the Dünya words at that ceremony. He basically worked backwards from the Dünya interview and punted for a possible date and place. Honest History has received from Özakinci photographs of the title page and table of contents of a book of Kaya’s speeches between 1927 and 1937. We are awaiting a translation of the preface of the book. 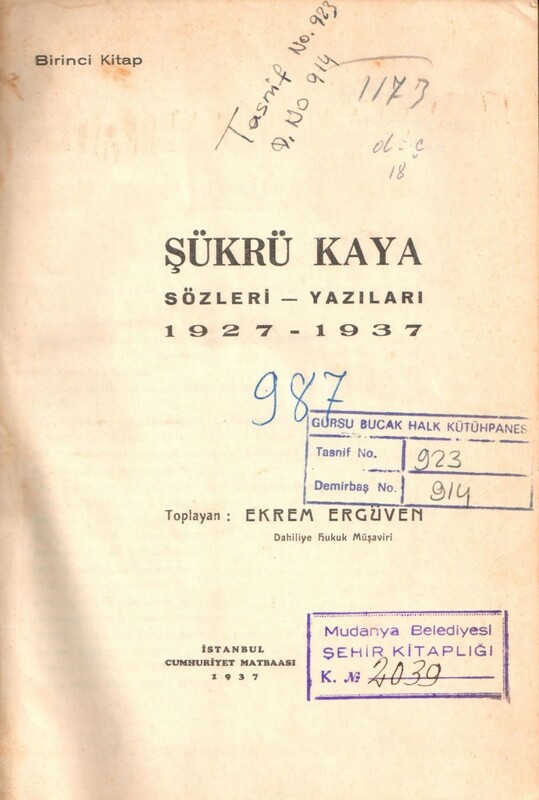 The book (published 1937) is called Şükrü Kaya: Sözleri – Yazıları 1927-1937, (Şükrü Kaya: Words – Writings 1927-1937) and it includes what were regarded as Kaya’s important speeches over this period, as selected by Kaya and Ekrem Ergüven, Internal Legal Counsel at Kaya’s Interior Ministry. There is no mention in the book of any speech being delivered at Çanakkale on 18 March 1934. What are we left with then? First, we have no evidence that Kaya delivered a speech at the Mehmets Monument at Çanakkale on 18 March 1934. There is no evidence that he was even in Çanakkale that day. Secondly, Kaya visited Gallipoli in July but there is no evidence he made speeches about ‘Those heroes …’ on that trip. Thirdly, we have from previous research found no evidence that Kaya was at Gallipoli during the visit of the Duchess of Richmond party in late April and early May when friendly messages passed between Atatürk and the pilgrims (although these messages did not include the famous ‘Those heroes …’ words). Fourthly, Kaya certainly gave a speech near the Mehmets Monument in August 1931 but that speech does not include the ‘Those heroes …’ words. While the text of this speech appeared in a contemporary newspaper, again Kaya did not include the speech in his 1937 collected speeches, presumably because he did not regard it as important, even though it was based on ‘an anecdote that … I heard from the great man’. In view of the other evidence presented in this article, it seems that Kocatürk’s caution was justified. As we said in the introduction to our resources on this subject, it is not up to Honest History to go on failing to find evidence of the words being said or written at particular times or places by Kaya or Atatürk; it is up to those who believe the words are Atatürk’s to provide robust evidence that they were indeed said or written during his lifetime. We have heard it said that it does not matter whether Atatürk wrote the words; by him allowing these words to be sent to Australia they became his words. Remarks like that undermine the discipline of history, based as it is on the search for and presentation of evidence. (They also raise a further question: if the words were sent to Australia when was this and where is the evidence?) Sliding away from a difficult evidence trail to say ‘evidence doesn’t matter’ really doesn’t cut it. As it stands, the ‘best’ evidence for how the ‘Atatürk words’ came into being remains the Dünya interview with an elderly, sentimental, possibly politically motivated or manipulated Şükrü Kaya in 1953, fifteen years after Atatürk’s death. That is not robust evidence. We cannot even be sure how much of the Dünya report is Kaya and how much is the journalist Onen, who also may have had a political axe to grind. (We are trying to find out more about Onen.) Yet, to alter only slightly the remark of Australian historian Douglas Wilkie in a very different context, people – even historians – like a good story. To finish, Honest History has said many times that the words commencing ‘Those heroes that shed their blood …’ contain admirable sentiments. Remarks about settling issues between nations without the spilling of blood would be much more admirable. They would mark the putting into practice of some other Atatürk words: ‘Yurtta sulh, cihanda sulh’ (‘Peace at home, peace abroad’). Ayhan Aktar, ‘Mustafa Kemal at Gallipoli: the making of a saga, 1921-1932’, Michael JK Walsh & Andrekos Varnava, ed., Australia and the Great War: Identity, Memory and Mythology, MUP Academic, Carlton, 2016, Kindle location 3048. This book is reviewed for Honest History by David Stephens. The English version the Embassy uses includes the line ‘There is no difference between the Johnnies and the Mehmets …’ which Honest History’s research based on Özakinci shows beyond reasonable doubt were composed by Alan J. Campbell in Brisbane in 1978 and accepted by Uluğ İğdemir of the then semi-official Turkish Historical Society. Aktar, op. cit., has evidence on the retrospective growth in Kemal’s military reputation. See section 12 of the Honest History research note. See note 2 above. The Embassy’s English translation includes the Campbell-İğdemir ‘Johnnies and Mehmets’ 1978 gloss. Again, see section 12 of the Honest History research note and the references linked from there which refer to the political environment in Turkey in 1953. Honest History and its associates are doing further work on this part of the story.